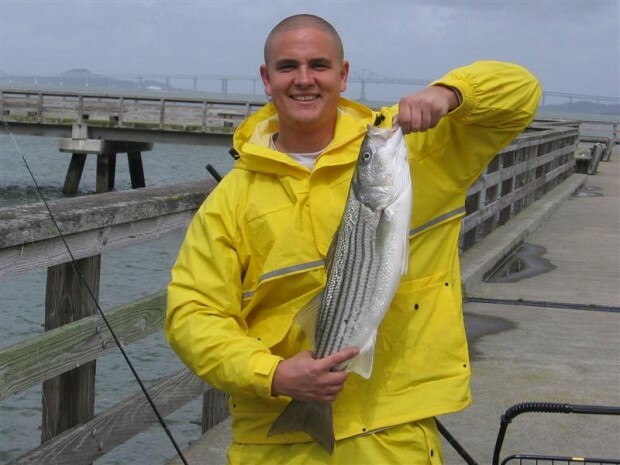 This week a judge in the U.S. District Court, Fresno, California, sounded what may be the death knell for striped bass in the not so Golden State. Politics and the fight over water has reared its head once again in California. (See article at the bottom.} It’s a far departure from what was once considered a magnificent, world class fishery. Van Campen Heilner, Salt Water Fishing, Alfred A. Knopf, New York, 1953. This was first written for the 1937 edition of his book. Homecoming travelers from Europe to the U.S.A., after passing Ambrose Lightship, have sighted rising from the cliffs behind Sandy Hook the twin lights of the Highlands. Flowing inland beneath them are the Shrewsbury and Navesink Rivers, the cradle of striped bass fishing in America. 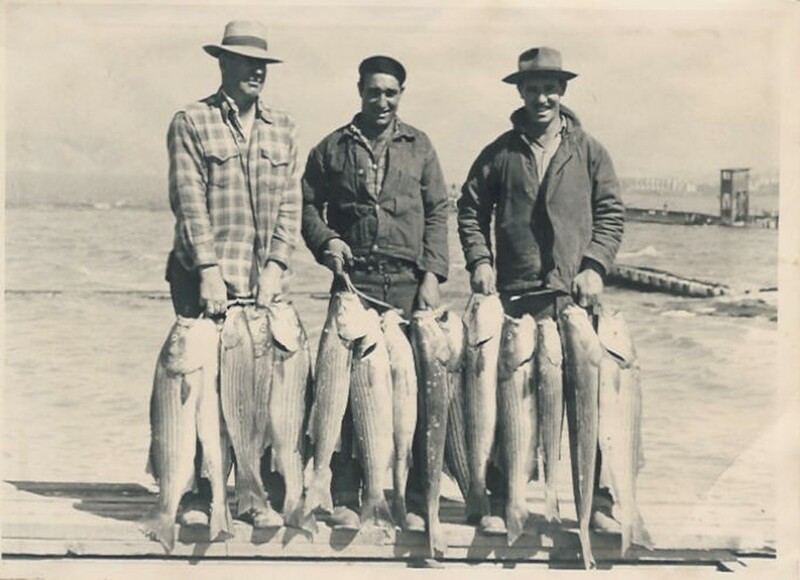 In the year 1879 there were 107 small striped bass shipped from the Navesink River and liberated in the Carquinez Straits near San Francisco. The size of the first shipment ran from 1 1/2 to 3 inches in length and a few were “medium sized specimens.” You will have to guess at what is meant by “medium sized,” for the records do not give details as to weight or length. 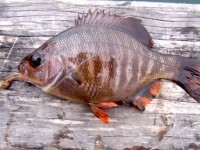 In 1882 there were 300 more brought from the Shrewsbury River and released in Suisun Bay, California. This shipment consisted of bass running from 5 to 9 inches in length. From these two shipments originated what is probably the finest striped bass fishing in the world. Liberated in waters ideally suited to them, with food in abundance and a climate hardly equaled on the face of the earth, the fish increased with amazing rapidity and to large size. In 1883, four years after the first shipment, a 17-pounder was caught. 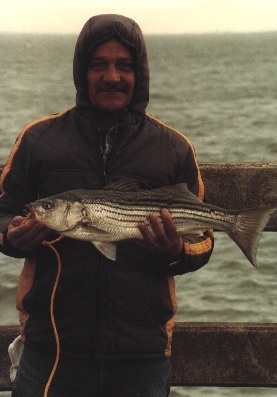 On March 11, 1884, an 18 1/2-pound fish was taken, and on June 16, 1889, ten years after the first planting was made, a 45-pound striper was netted. 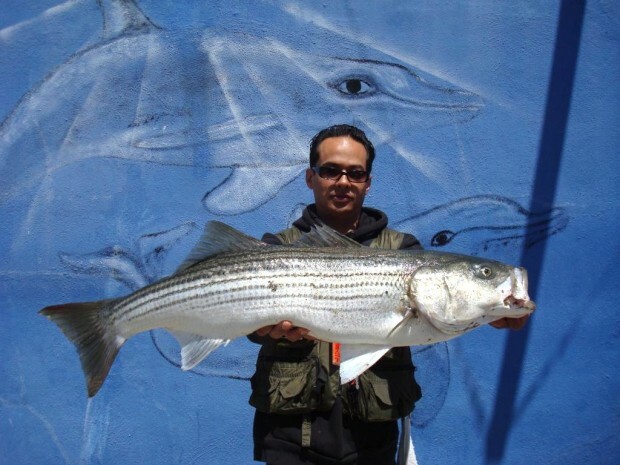 These records are probably the most reliable in existence as to the growth of stripers over a period of years. 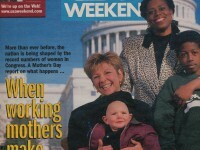 From then on it was a panic. 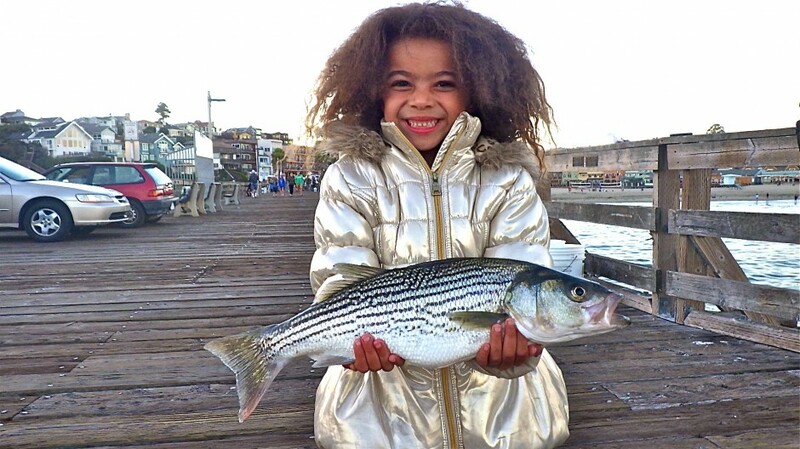 Stripers multiplied so rapidly in the climate-nurtured California waters that commercial fishermen and sportsmen had a field day. 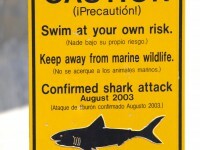 The commercial catch increased to such numbers that it far outstripped anything ever brought in on the Atlantic coast. 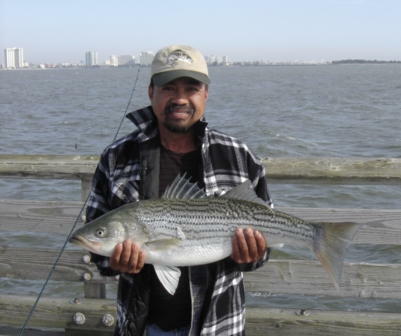 Forty and fifty-pound stripers fell to the anglers’ rods as an almost everyday occurrence. 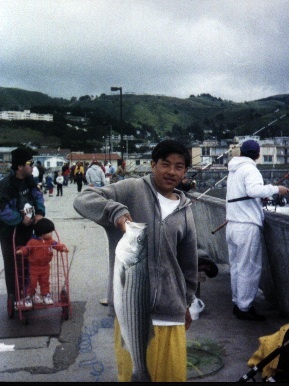 The San Franciscans and their brother anglers north and south of the Peninsula became “striped bass minded” and striped bass mad they still are today. Then a discordant note crept into this beautiful Elysian symphony. While the bass showed no decrease in numbers they commenced to show a decrease in size. This, as has so often been the case, was found to be due to excessive netting. 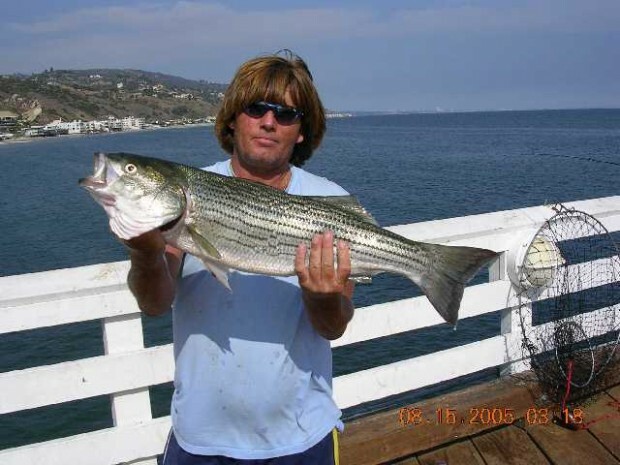 But by now, so many Californians were fishing for stripers with rod and reel and so powerfully had they branded themselves together that they were able to stop once and for all the sale of striped bass in the Golden State. In presenting their case to the Legislature, one of their arguments was that in one year over $180,000.00 worth of sardines had been sold to sportsmen as bait for stripers alone! Think of it! An amazing and wonderful thing. And as if this was not enough they made it mandatory for salt water anglers to have a fishing license and limited themselves to five a day and nothing under 12 inches. With these rules in force the stripers staged a quick comeback and 40- and 50-pounders were soon as common as they formerly were. A relative of mine used to tell me of catching striped bass around Robbins Reef Lighthouse in New York Harbor in the 1880′s. I’m afraid those days are gone forever. But I have great faith in the Fish and Game Commissions of New York and New Jersey and nothing is impossible. 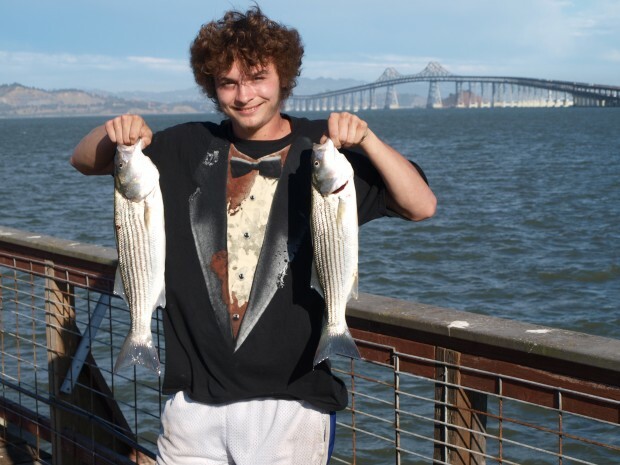 But for stripers close to a great metropolis, in fact, in it, you have only to go down to Bakers Beach in the very shadow of the Golden Gate Bridge and see enough surf fishermen fishing for stripers to restore your faith in mankind. 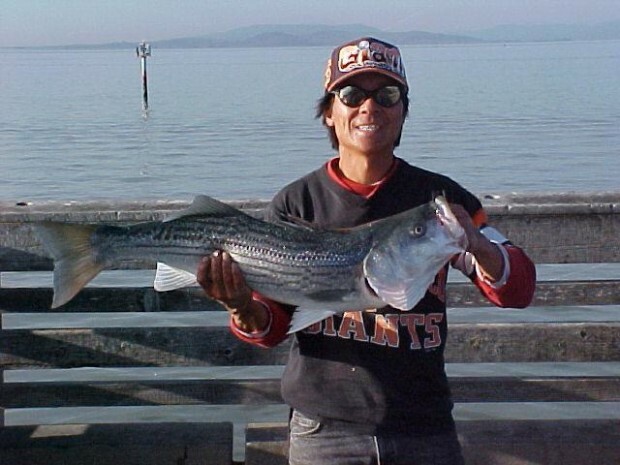 You’ll find surf fishermen all over the place and to even whisper “stripers” to a San Franciscan is to see his face light up instantly and to have him launch at once into a long discussion as to the hows and whys of his favorite sport. I had been bargaining for several days with a Chinese friend of mine up on Grant Avenue for a beautiful mandarin coat that he claimed had belonged to a lady-in-waiting to the Empress Dowager of China. It was a beautiful coat, we both agreed on that, with a hundred appliqued butterflies on it, but the one thing we could not agree on was the price. Finally we had reached the point where a compromise looked possible. “I’ll tell you what I’ll do,” I said. “I’m leaving tomorrow night but I’ll come back in the morning and give you my final word on it.” “Ah!” he said, “but I shan’t be here tomorrow morning. 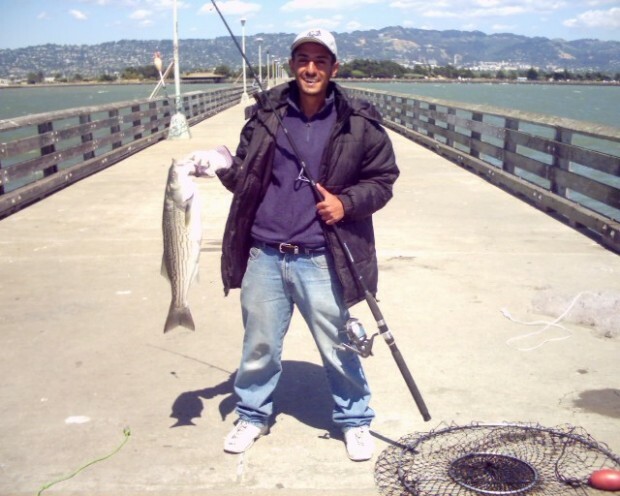 I’m going striped bass fishing at Benicia.” And that was that. 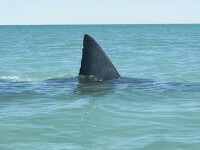 He wasn’t the only one that let striped bass fishing interfere with business. 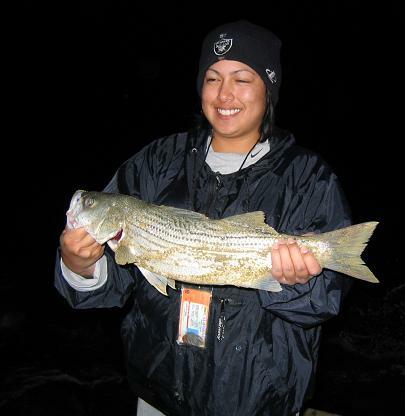 At Rio Vista on the Sacramento, in the later part of September, the oldest and original striped bass derby on the Pacific coast is held each year. One year there were 9,000 entrants; the next, 15,000 and I doubt not but in time every man, woman and child in the state of California will be entered. And all for a one-day fishing contest! They shoot off a bomb to start them off and another one to stop them. And the prizes! One year it was a 26-foot cruiser, completely equipped, ready to sail away from the dock; the next, five automobiles for the first five prizes, to say nothing of electric refrigerators, radios and heaven knows what else. 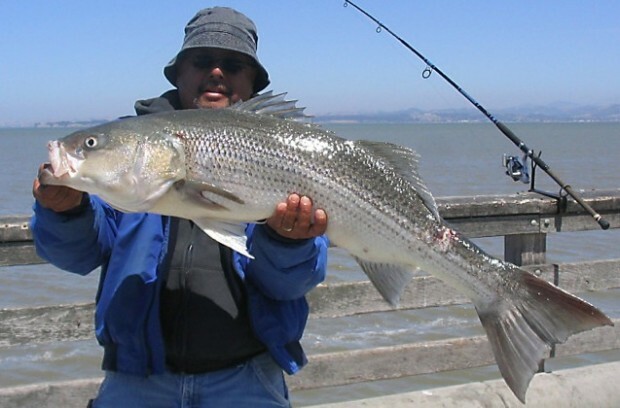 And not only that, but each May they hold at San Rafael what is known as a striped bass carnival which is attended by upwards of 30,000 people who come to talk and listen to talks about striped bass and enjoy themselves in every way except fishing. 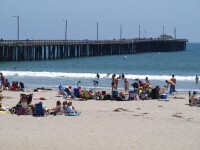 If you’ve never surf fished along the California coast you have a great treat in store. I’ve done it for years and it’s some of the most beautiful surf fishing in the world. The great mountains running down to the sea, the long lines of breakers thundering in, fresh from the Sandwich Islands, and best of all, the climate. As some of my readers must have guessed by now, I like California. In fact, I’m a confirmed Californiac. It’ as close to heaven as I ever expect to get. There may be a little fog now and then around Frisco (Los Angeles papers please note), but it doesn’t interfere with the striped bass fishing nor with one of the most cosmopolitan and romantic cities that was ever built. And if it wasn’t for the fog they’d never get the moisture to grow some of the biggest potatoes, the tallest trees, the largest fruits and flowers, the longest bridges and the most beautiful women in the world! I was down at Monterey Bay one time. It’s beautiful there, too. The bay is half-moon shaped and on the north arm you have Santa Cruz and the beautiful mountains behind it. On the southern horn you have Del Monte and Carmel. I couldn’t speak when I first saw Carmel. I felt just like I did when I stood on the cliffs of Ravello near Amalfi and looked down on the Mediterranean and the cypress trees and drank a lot of Lachryma Christi and then shed real tears, it was so beautiful. In between and on the land side of the bay you have the lettuce fields of Salinas, miles of them, stretching under the blue sky, and you have the Salinas River, which if you motor across there, you’ll cross so many times you’ll expect to meet yourself coming back. There was a gang of us and we camped underneath the railroad bridge alongside the river. There weren’t many trains and when they came by they didn’t bother us. Bert McCloud from Stockton was headman and his seventy-three-year-old father, God bless his soul, was doing the cooking, when he wasn’t surf fishing, and how he could cook! The actinic rays of the sun were so strong that we were forced each day to cover our faces with grease paint, which made us look like a bunch of Indians. 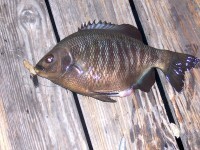 We fished the slough at the mouth of the river and though I wasn’t very lucky that trip the others got some fine fish. The sea lions bothered us a lot and we carried a rifle on the beach with us to chase them out of the slough. When they came in the fishing went pfft for the rest of that tide. We used to catch a lot of interesting little fish called surf fish. They’re transparent and give birth to their young alive and you could see the baby fish inside the mother all nested together waiting to be born. But it was the stripers that we’d come for, and when one of us would hook one it was a pretty sight to see him carried down the beach with the white surf tumbling and foaming in the background and his rod sweeping downward in the long graceful nods. And then he’d get him to the wet sand and maybe he’d be a forty pounder and we’d all gather round and congratulate him and begin to think how Dad McCloud was going to dress him up for us for a dinner. There were other trips for stripers too. Up in the Carquinez Straits where they used to ferry the whole Overland Limited across on a boat was the home of some mighty stripers. They troll for them up there with spoons and plugs and a big fish from a light boat in that swift tide is something to remember, I can tell you. Right outside the Golden Gate was always a wonderful looking spot to me and I’m going there sometime with Otto and Bill Bassett and the Punkinseed and see what we can see. 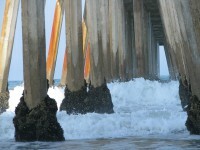 One summer I took a car and motored down the whole length of the glorious California coast to the Mexican border. Whenever I saw someone fishing in the surf I stopped and talked to him. 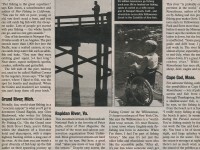 They were a friendly lot, those surf fishermen, they always are and they willingly gave of their advice and experience. They were catching surf whiting (Menticirrus undulatus) which is like our eastern surf-kingfish or whiting and yellow-fin and spot-fin croakers. Clams and sand crabs were the favorite baits. In fact at Coronado I was warned not to go swimming in the surf as the sting rays were so numerous as to make bathing dangerous. From the Smith River in the north to the Rajuana in the south I met a sympathetic and hospitable army of anglers standing in the surf or trolling in rivers’ mouths and slues for salmon or stripers, always ready to give helping advice or to take you on a fishing excursion at the drop of a hat. I was born in the City of Brotherly Love on the banks of the Delaware and spent the summers of my childhood on the Jersey coasts and marshes. The surf and sod banks from Barnegat to Cape May form some of my earliest memories. But were I to choose, I should like to spend the twilight of my life somewhere near the shores of Yerba Buena Cove with the sun setting through the glorious Golden Gate and my rod bending and swaying to the rush of a well-hooked striper while behind me the mountains and above me the blue sky bore witness that I was breathing the clean wind-swept Pacific air of – California! FRESNO, CA – Today, in U.S. District Court, Judge Oliver Wanger indicated he will approve a settlement agreement in the case filed by the Coalition for a Sustainable Delta and other water users against the California Department of Fish and Game (DFG) related to the management of striped bass, an invasive species that is known to feed upon endangered salmon and delta smelt in the Delta. Judge Wanger’s written ruling will be forthcoming. 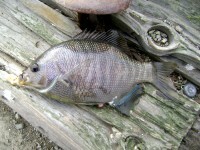 Under the settlement DFG will collaborate with the National Oceanic and Atmospheric Administration (NOAA) and the United States Fish and Wildlife Service (FWS) to develop a joint regulatory proposal that will address the impacts of sport-fishing regulations on the population of non-native striped bass in the Delta. The lawsuit was filed in late 2008 in the U.S. District Court in Fresno before Judge Wanger. The settlement was reached after the DFG’s own experts in the case acknowledged that striped bass predation is responsible for the loss of a significant number of protected, native salmon in the Delta. The Department’s experts estimate the take could be as high as 25-50 percent annually of both the endangered Sacramento River winter-run and the threatened Central Valley spring-run Chinook salmon populations within the Delta. Striped bass predation has been increasingly identified as a major reason behind salmon and delta smelt fishery declines, but state regulators have repeatedly failed to address the problem. 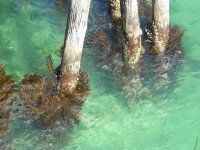 Striped bass are an invasive species that were planted in California as a sport fish in the late 19th century. DFG has long been protecting the voracious predators at the expense of salmon, delta and longfin smelt, and other endangered species through the imposition of size (18 inches minimum) and bag (2 per day) limits. At one point DFG actually stocked the Delta with millions of striped bass in an attempt to further increase their population. 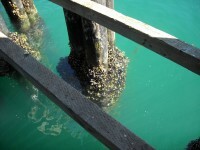 While DFG was taking these actions to protect and increase the striped bass population in the Delta, salmon populations have steadily declined leading to devastating government imposed water pumping restrictions for residents, farms and businesses and the closure of the last three commercial salmon fishing seasons. Hundreds of thousands of acres of productive farmland were fallowed since 2008, resulting in the loss of thousands of jobs and billions of dollars in economic activity. Commercial salmon fishermen have faced a string of tough years that have resulted an estimated loss of $1.4 billion dollars and 23,000 lost jobs. Under the settlement, a comprehensive proposal to address striped bass predation in the Delta will be developed by state and national fishery management agencies that will include the following components: Appropriate changes to regulations that protect non-native striped bass at the expense of threatened and endangered native fish; Development of an adaptive management plan to research and monitor the overall effects on listed species; and Creation of a $1 million research program focused on predation of protected species. 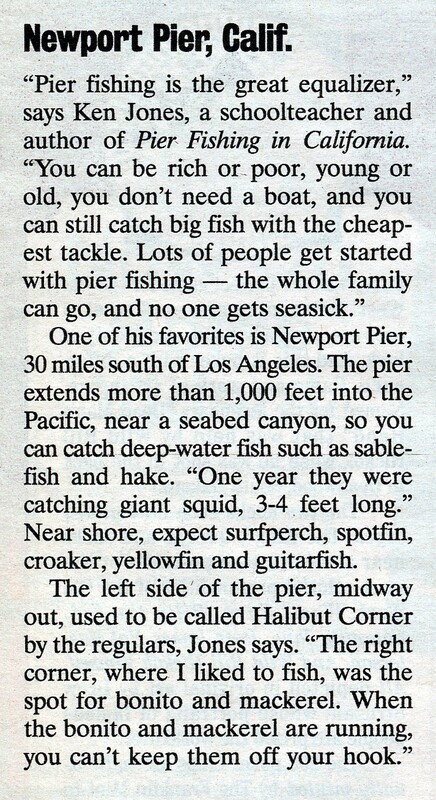 Posted in Daily musings..., Saltwater Fishing and tagged with California piers, pierfishing, saltwater fish, striped bass. RSS 2.0 feed.